I actually bought and finished this last week before I forgot to include it in my mailbox post so here it is! Nice haul! I hope you enjoy your books. I really need to get into Richelle Mead's series. I've only read no.1 of VA so far. Happy Belated Blog Anniversary to you!!! Did you buy yourself/your blog a gift? I just finished The Fiery Heart and I can tell you it's an amazing book. I have yet to start the Bloodline series. I have the first one though. 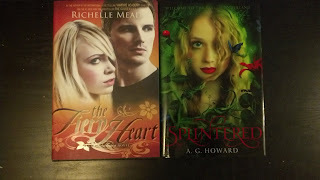 :D I really want to read Splintered, I just love the cover! and I see a lot of people getting Defy. I hope you enjoy all your books! and thanks for stopping by my STS. I have yet to read anything by Richelle Mead but I'm hoping to sometime in the near future! Thanks for stopping by my blog. :) I absolutely LOVE your blog design.